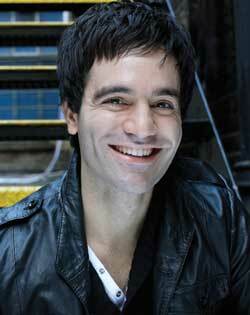 Ramin Karimloo was born in Iran, but moved to Toronto in Canada as a young child. He began his career there singing in rock bands. He decided to set sail from there and sing on the cruise ships MS Carousel (Airtours) and MV Oriana (P&O Cruises) which eventually brought him to the UK where his first experience was in panto by playing Aladdin in Chatham. Still in the comedy genre, Karimloo went on to appear as a Pirate/Policeman, covering the Pirate King on a national tour of The Pirates of Penzance which was directed by Ian Talbot and opened at Regent's Park Open Air Theatre. This was followed by the role of Artie Green in the national tour of Sunset Boulevard when he also covered and played the lead Joe Gillis. Ramin spent the next year playing Feuilly and understudying Marius in Les Miserables at the Palace Theatre and was then cast as Raoul in The Phantom of the Opera at Her Majesty’s. Latest roles include Enjolras in Les Miserables Chris in the tour of Miss Saigon, the Phantom in the Phantom of the Opera and Jean Valjean in Les Miserables. Ramin has been playing the Phantom in Andrew Lloyd Webber’s Love Never Dies at the Adelphi Theatre. He recently did short concert tour "A Night with the Phantom" and has just finished playing Jean Valjean in Les Miserables at the Queen's Theatre for a limited period.